When I did my 2011 challenge post, I mentioned that it was likely that I would find another challenge the next day, and that is exactly what happened! One of my goals last year was to finally read some Jane Austen. That didn't actually happen, and it is going to be among my reading goals for this year. I've bought the ebooks, now I just have to actually read some. So, as an added incentive, I am signing up for The Sense and Sensibility Bicentenary Challenge which is being hosted by Austenprose. My plan is to read the book and watch one film. 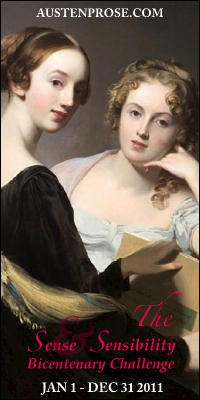 Time-line: The Sense and Sensibility Bicentenary Challenge 2011 runs January 1, through December 31, 2011. Enrollment: Sign up’s are open until March 1, 2011. First, select your level of participation. Second, copy the Sense and Sensibility Bicentenary Challenge 2011 graphic and include it in your blog post detailing the novels or movies that you commit to reading and watching in 2011. Third, leave a comment linking back to your blog post in the comments of this announcement post. If you do not have a blog you can still participate. Just leave your commitment to the challenge in the comments below. Check Back Monthly: The Sense and Sensibility Bicentenary Challenge 2011 officially begins on Wednesday, January 26, 2010 with my review of the novel The Three Weismanns of Westport. Check back on the 4th Wednesday of each month for my next review in the challenge. I have seen most of that film. That's part of the issue with reading a lot of these classics. I feel like I already know the stories. Oh I like the sound of this. S&S is one of the few Austen novels I've never read, nor have I seen or read any adaptations. Hi Marg, thanks for joining the challenge. I hope you enjoy your selections. I looks forward to your comments. The great thing about reading the book S&S after seeing the Emma Thompson movie is that you realize how much is left out of the movie! I was amazed at some of the major plot info that wasn't in the movie. Sarah, I haven't read any Austen before, which is part of the reason why I have signed up for the challenge. Hippychick, maybe it won't feel quite so familiar when I read it then. Amy, I hope that I enjoy it as you have. Laurel Ann, thank you for hosting the challenge. Bree, sounds like a challenge for you. I think I like the BBC/NPR Masterpiece Classic films the best. The Emma film was excellent, and the S&S film was better than Hugh Grant (in my opinion). I did some posts about the Jane Austin films (click on my "movie" label if you're interested). This sounds good - I have a beautiful copy I received for Christmas but haven't read yet. I haven't seen the film either!